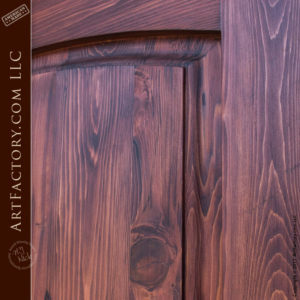 At ArtFactory.com, we make this custom two panel wood door that is perfect for anyone who is looking for a traditional entrance door with additional security and durability. Like all of our custom doors, it is built using only old world techniques such as mortise and tenon joined construction, that allow for strong and superior quality. All of our custom doors are built with thick, solid, naturally air cured, timber. We never use faux woods, particle or press board, or any type of fast process construction techniques. This commitment to quality materials and expert level craftsmanship are what separates our products from the disposable, mass production doors that you will find at big box retailers. We have been designing and building custom, fine art quality, handmade entrances since 1913. In fact, every product that leaves our shop is unique, one-of-a-kind, and never to be exactly reproduced. This custom two panel wood door is no exception. 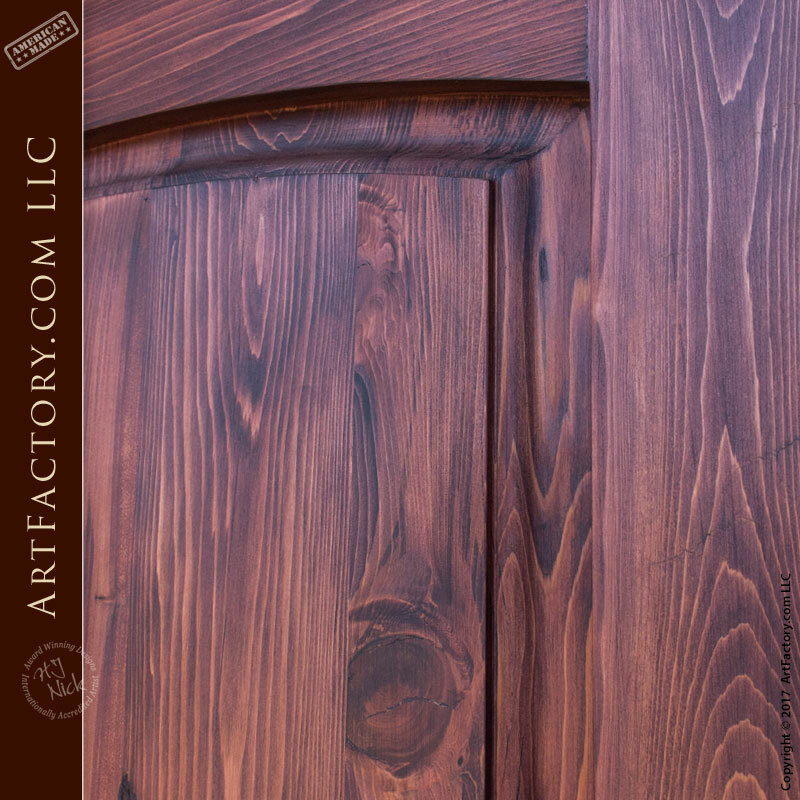 Every door and wood product that we built is hand finished to fine art quality standards. These finishes are applied using a hand rubbed, multi step process that blends the stain into the grain of the wood. We offer hundreds of different finish colors, or if you prefer we can also match to any existing sample. We also have no limitations on size, and can build to fit an exterior, interior, residential of commercial entrance. 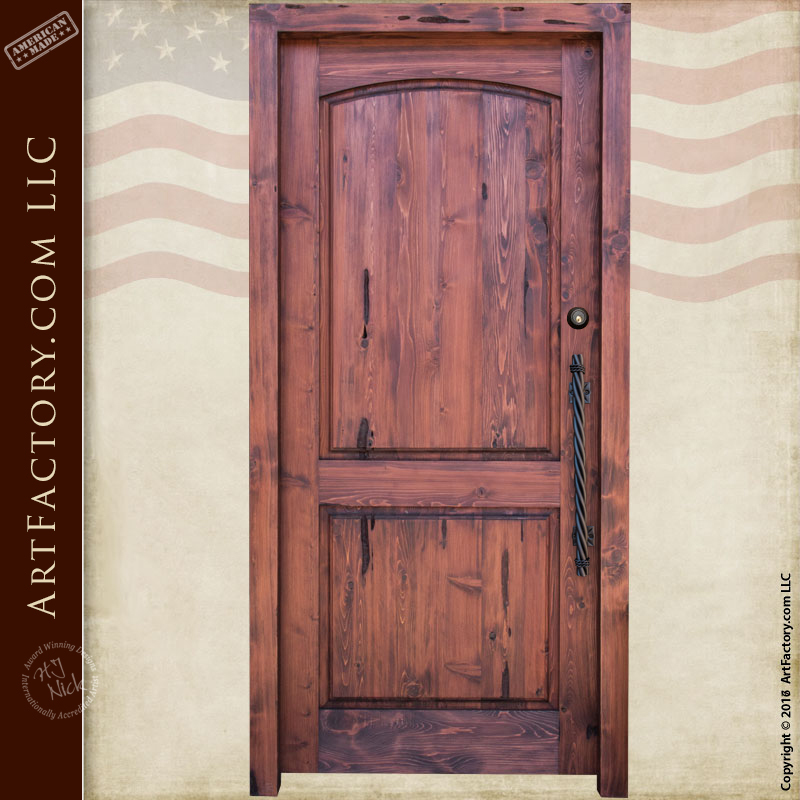 To top it all off, when you buy a custom door from ArtFactory.com, it guaranteed forever because we believe that it should be the last door that you will ever have to buy. The door as pictured features our popular long twist door pull. As with all of our custom doors, your hardware options are fully customizable. You can choose from any of our hundreds of styles of custom door handles and theme door pulls, or have our designers create one for you. We can also build from any picture, drawing, idea, or any design from history. We specialize in building historically inspired designs, and when we do so, we use the same techniques and materials as the original for history. All of our hardware comes advance patinated with a hand applied, heat infused iron oxide patina. This type of finish won't crack, peel, or flake like paints and powder coats. 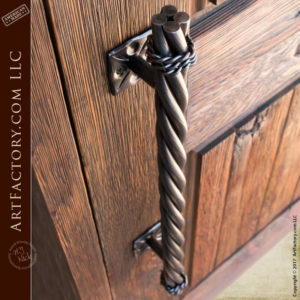 Our door hardware is always hand built to your specifications by our master blacksmiths using hand forged wrought iron. When we say hand forged, we mean hand hammered by a classically trained blacksmith. We never cast, drop forge, build from a mold, or use any type of fast or mass production process when building our hardware. This means that every time, you will receive a fine art quality piece of hardware that is uniquely yours, of investment quality, and built to stand the test of time. Call us at 1-800-292-0008 for pricing on the custom two panel wood door, or any of our other custom wooden doors.